In a robot, strength is important, but sometimes it's more important how the strength is directed. 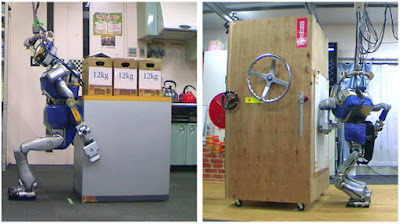 If you've ever had to move a refrigerator, you know that the best course of action involves pushing or pulling the object instead of lifting up, directly. The latest human-like robot developed by the University of Tokyo's JSK Laboratory takes that logic and expands on it, pushing, pulling, and scooting washing machine and large objects. The robot uses impressive posture and crouches, bracing itself so well that if it were human, it would be protecting its back from lifting strain. Researchers Masayuki Inaba and Kei Okada programmed the robot, an HRP-2 model, to approach each large object with a set of motions like pushing with it shoulders, forearms, or with its back against the object. Just like a human, the robot automatically cycles through the motions until it finds a successful way to move the object. The robot finds an appropriate moving posture by analyzing the object's weight, dimensions, and friction against the ground surface. The robot's first attempts are always lower force manipulations, and as it tries again, each attempt increases in force. The robot also is quite stable on its feet. It is programmed to adjust its footsteps to be shorter or longer based on how far it is able to move the object. A truly smart robot adapts to a variety of challenges on the fly-like adjusting its posture to push or pull big objects, just like a person does. But what comes naturally to humans is a lot more complicated for robots. It sounds simple, but this is really cool behavior, as IEEE Spectrum explains. This kind of improvisational problem-solving is an extremely human trait. Lots of robots, especially ones currently being used in factories and whatnot, are only programmed to do one task, in one way, in one place. For example, a robot that stays in the same location on the work floor and lifts heavy boxes coming down a pre-designated conveyor belt. Even more impressive is that the robot doesn't stumble or fall-like I might. It can adjust the size of its steps based on how much, or little, the object is moving. This is also a big deal, because it not only shows the robot replacing what could literally be back-breaking labor for a human, but that it could also perform the task better than a human. According to Spectrum, the 'bot was presented by University of Tokyo researchers in a paper called "Whole-Body Pushing Manipulation With Contact Posture Planning of Large and Heavy Object for Humanoid Robot," at IEEE's International Conference on Robotics and Automation in Seattle last week.